10 Best Places for Gelato in Arizona! What makes gelato so good? It’s hard to pin it down to just one thing. The Italian dessert is made with less fat, less air, and more milk than its American cousin ice cream. It’s also churned at a slower speed, giving it more density than ice cream. 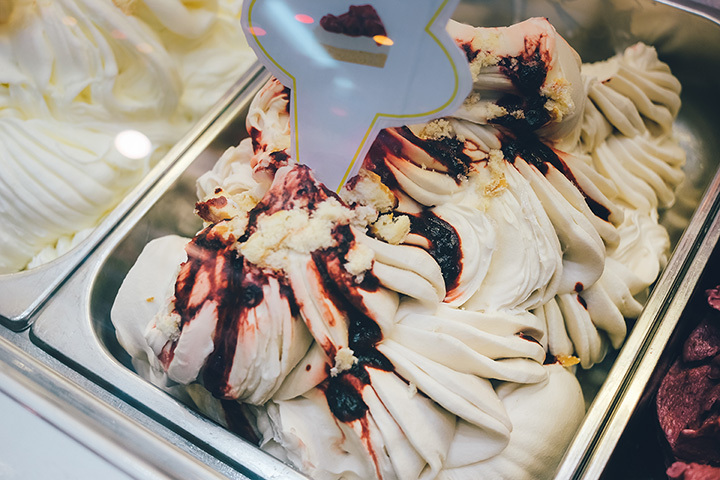 Gelato spots also use a range of flavors and toppings that make the frozen treat irresistible. Arizona is home to many such places. These local gelato spots are in the business of serving up some seriously tasty flavors. Here are the 10 best gelato places in Arizona. You don’t have to go to Italy to get authentic gelato. That’s because Frost uses imported Italian ingredients to create their delicious desserts. The Tucson-based Frost was originally created after the owners tried their first taste of gelato on a trip to Italy. They decided to open their own gelato shop to satisfy their insatiable hunger. Now they have locations throughout the United States and abroad. You can try their mix of flavors at their Tucson, Phoenix, or Gilbert location. Frost has over 50 flavors including favorites like coconut, caramel macchiato, and cinnamon apple pie. If you need a pick me up, try the affogato—a gelato and espresso hybrid. That’s Amore Gelato doesn’t just have an Italian name. It also has an Italian staff, menu, and flavors. That’s Amore is a family owned and operated store opened by immigrants from Milano, Italy. Their Italian roots shine in the many artisan-crafted gelato flavors, including coconut, pistachio, and tiramisu. That’s Amore also has Italian infused menu items including cannoli, espresso, and gelato cakes. Almond Snickers, New York cheesecake, salted caramel. These are just a few of the mouthwatering flavors available at the Gelato Spot. The Gelato Spot uses authentic flavors from Northern Italy to create their delectable desserts. That’s because they’ve forged relationships with Italian gelato masters and import many of their ingredients. The result is some of the best gelato in the state. The Gelato Spot has three locations—two in Scottsdale and one in Phoenix. In addition to their standard menu, they serve pizza, cakes, coffee, and a rotating list of special flavor gelato. Owners Walter and Marti know a thing or two about gelato. The duo attended the Gelato University near Bologna, Italy, before opening up Gelato Dolce Vita. This Mesa favorite uses handmade, additive free ingredients in making their renowned gelato. You’ll also find tasty flavors like crème brulee, limoncello, and amaretto at their store. If you’re looking for more Italian flavor, look no further than Gelato Dolce Vita. It doubles as a deli that sells authentic meats, cheeses, and oils from Italy. Choice is king at Gelato 64. This Chandler gelato shop has 48 flavors at all times, six of which are rotating. Though it would require a Herculean effort to try all their flavors, they’re just so tasty that you might be up to the task. Gelato 64 makes their artisan gelato from scratch every day. Their delicious gelato, great prices, and friendly service make this an all around great spot. Life is like Gelato. Enjoy it before it melts. That’s the motto at the ever-popular Tazzina di Gelato. This Tucson gelato spot combines old world, Italian flavors with an American twist. You can find flavors like death by chocolate, avocado basil, and the aptly named greatest of all time on their menu. Tazzina di Gelato also sells shakes, Italian sodas, and pints and quarts of their gelato. If that’s not enough, they also do catering meaning you can enjoy their gelato on any occasion. Giovanni’s is all about Italian desserts. This Tucson Gelato shop has classic Italian menu items like espresso, tiramisu, and cannoli. While each treat has its own delicious taste, the gelato is the real star of the menu. Giovanni’s has over a dozen flavors of well-priced gelatos on deck. Though it opened recently in 2015, Giovanni’s has created a loyal customer base by having all around great gelato, desserts, and beverages. Pussycat Gelato may be brand new, but it’s already gotten quite the following. This Old Town Scottsdale gelato spot feels like it belongs right in Rome. They sell espresso, biscuits, and authentic gelato. Pussycat sells three different, equally delicious types of gelato—white based, chocolate based, and dairy free. As a bonus, their portions are extra hefty and reasonably priced. If you travel down south, don’t forget to make a stop in Bisbee. Their Bisbee storefront opened late last year. Try one bite of Cool Gelato Italiano and you’ll be hooked. This Old Town, Scottsdale gelato shop is the brainchild of husband and wife duo Alberto and Letizia. These experienced gelato makers were trained in the food industry in Italy. They’ve brought over 20 distinct Italian gelato flavors to the Valley. In addition, their gelato is made without preservatives or chemical additives. Their fresh, authentic gelato matches up with the best of gelato shops. Feeling adventurous? Head to Grateful Spoon. This Phoenix gelato shop has some truly unique gelato flavors. Among their inventive flavors are options like Nutella, chocolate peanut butter, and blackberry Sauvignon. Grateful Spoon specializes in small batch gelato made using the same methods as Italian gelato. They also use natural products and have vegan friendly options on their menu. They also have happy hour. You can get 50 percent off scoops on Monday through Friday from 3-5 p.m.